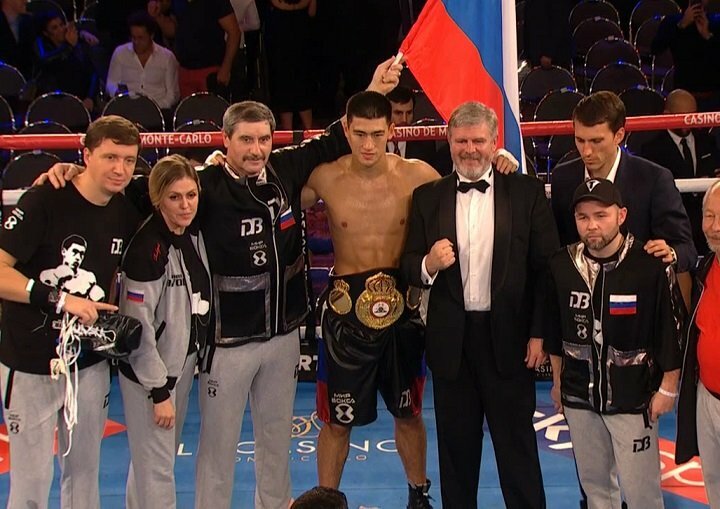 WBA light heavyweight champion Dmitry Bivol (12-0, 10 KOs) looked great in smashing Trent Broadhurst (20-2, 12 KOs) by a 1st round knockout on Saturday night in the Russian fighter’s first defense of his title at the Salle Medecin in Monte Carlo, Monaco. Televised by HBO Boxing, Bivol landed a straight right hand to the chin of Broadhurst in the finals seconds of round 1 to score a 1st round knockout. A bleeding a badly hurt Broadhurst stayed down on his back a long time before he finally got back to his feet. Earlier in the round, Bivol was given credit for a knockdown by referee Howard John Foster after bumping into Broadhurst. No punches were thrown during the knockdown. Fortunately for the boxing fans, the blown call didn’t impact the results of the fight. Bivol will be defending his title next against the winner of the November 25th fight between Sullivan Barrera and Felix Valera fight. “I hope I can be the best pound for pound fighter one day,” said Bivol. “Many guys are good in the light heavyweight division, but we will see who is better. The WBA said the winner of that fight [Sullivan Barrera vs. Felix Valera], we must make mandatory defense. I’m ready for mandatory defense. Who my opponent, whether it’s Sullivan Barrera, I’m ready. Every time I go in the ring, I believe I will be the winner,” said Bivol. WBA World bantamweight champion Jamie McDonnell (29-2-1, 13 KOs) got a lucky break against challenger Liborio Solis (25-5-1, 11 KOs) with their fight being ruled as a no decision. McDonnell was cut over his left eye from a clash of heads in round 3. The cut was bad enough for fight to be halted. Solis had gotten the better of McDonnell in all 3 rounds, and it looked as if he was going to be a problem for him if the fight had gone the full distance. McDonnell, 31, doesn’t plan on staying around the bantamweight division for a third fight with Solis. McDonnell will be moving up in weight to super bantamweight. Solis lost a year of his career waiting for a rematch with McDonnell after the World Boxing Association ordered the two fighters to face each other again. McDonnell beat Solis by a controversial 12 round unanimous decision last year in November. The boxing public thought Solis had done enough to win the fight. Former WBA 122lb champion Scott Quigg (34-1-2, 25 KOs) defeated an over-matched Oleg Yefimovych (29-3-1, 16 KOs) in defeating him by a 6th round stoppage victory in a WBA featherweight title eliminator. Quigg unloaded Yefimovych in the 6th round until the referee stopped the fight. Yefimovych was taking big shots from Quigg in rounds 1-5. By the 6th, it was clear that the fight needed to be halted because it was not a competitive mach. In a surprising result, European heavyweight champion Agit Kabayel (17-0, 12 KOs) defeated former heavyweight world title challenger challenger Dereck “Del Boy” Chisora (27-8, 19 KOs) by a 12 round majority decision. Kabayel, 26, showed fast feet and surprisingly good hand speed and boxing skills to get the better of the 33-year-old Chisora. This fight came down to which of the two wanted it more. Kabayel showed that he was willing to do the hard work in the early rounds to build up a lead. Chisora waited too long to get into the fight. By the time he did mount a comeback in the later rounds, he was too far behind in the scoreboards to get the win. The scores were 115-113, 115-114 for Kabayel, and 114-114.